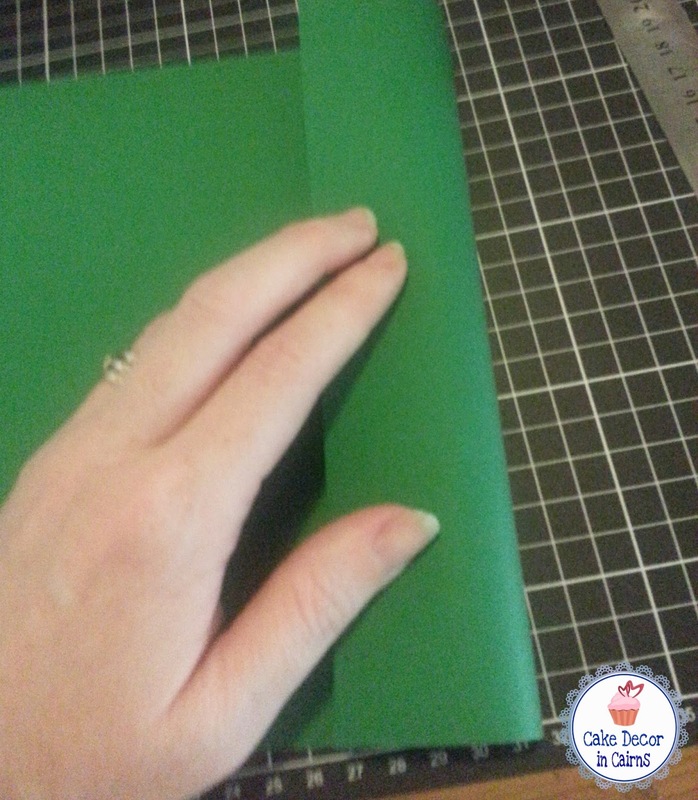 Join me over the next few weeks exploring the 6 different shapes included in the box. 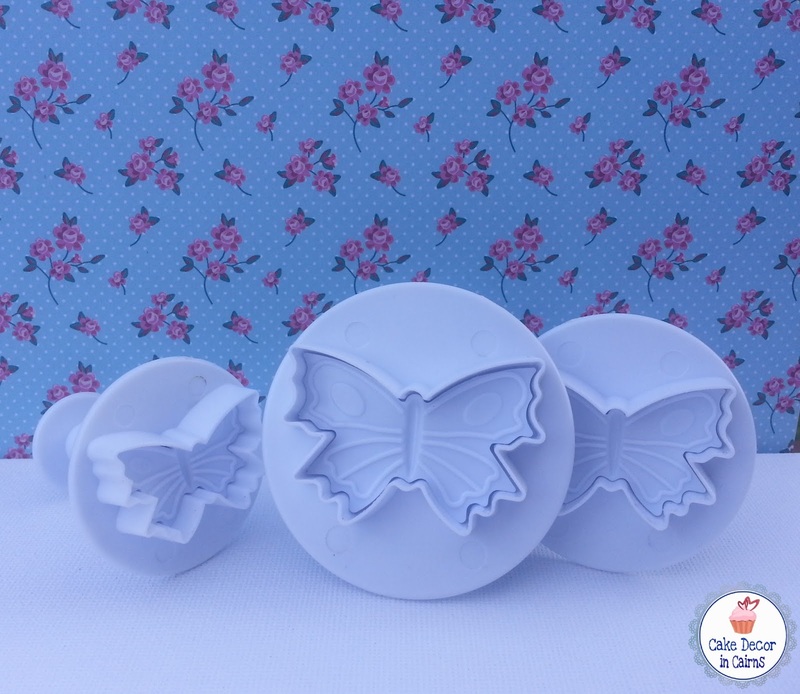 Be inspired to get your cutters out and make some gorgeous sugar decorations that you can store and use up to 6 months later. So come on let's get started. Get yourself set up with a mat, rolling pin, CMC/Tylose treated fondant in your colour choice, and let's have some sugar play! 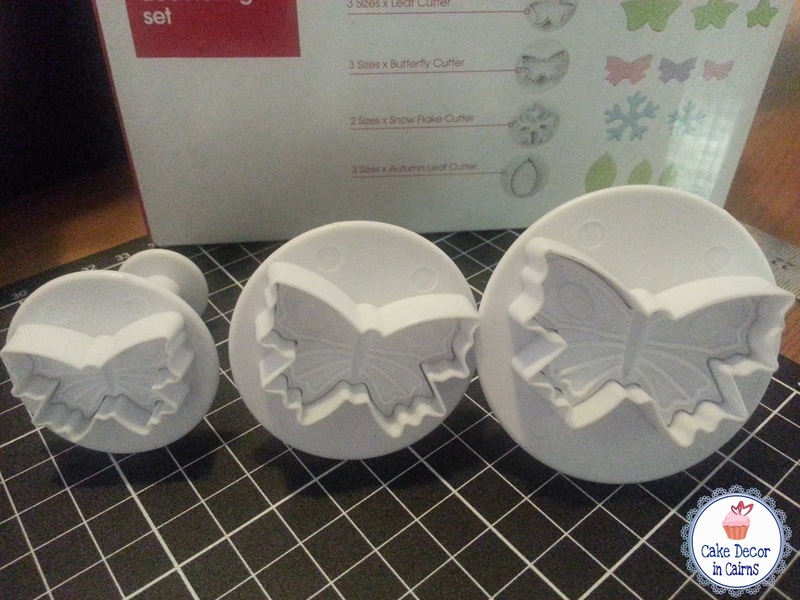 The first set from this fabulous box is the Butterfly Cutters in three different sizes. Now listen, if you don't have this set at your Kmart there are many other places you can buy them from. Off the top of my head there's ebay, Robins Kitchen and countless numbers of other cake decorating suppliers. I also got to say, I actually bought a set myself yesterday to specifically present this series to you. Kmart have no affiliation with me. 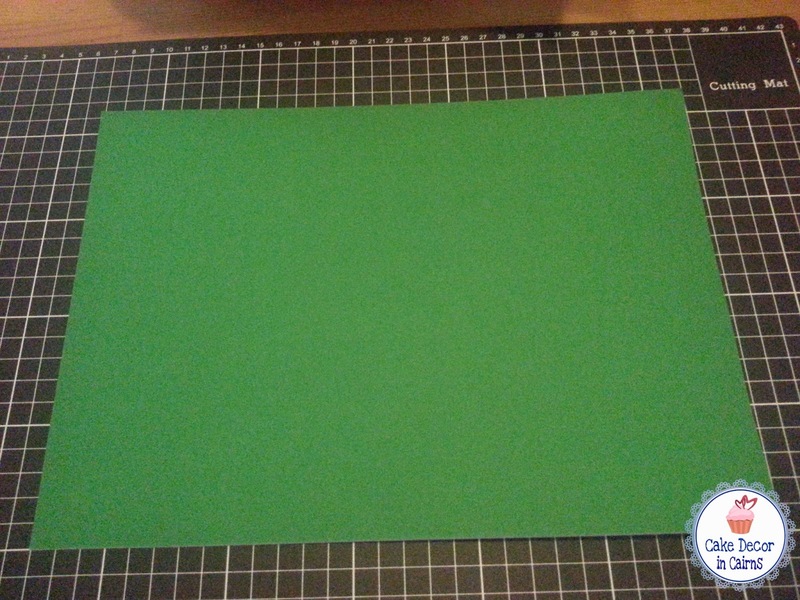 Now the first thing I want you to do it get yourself a piece of A4 cardstock, the thicker the better, however make sure you can still fold it. 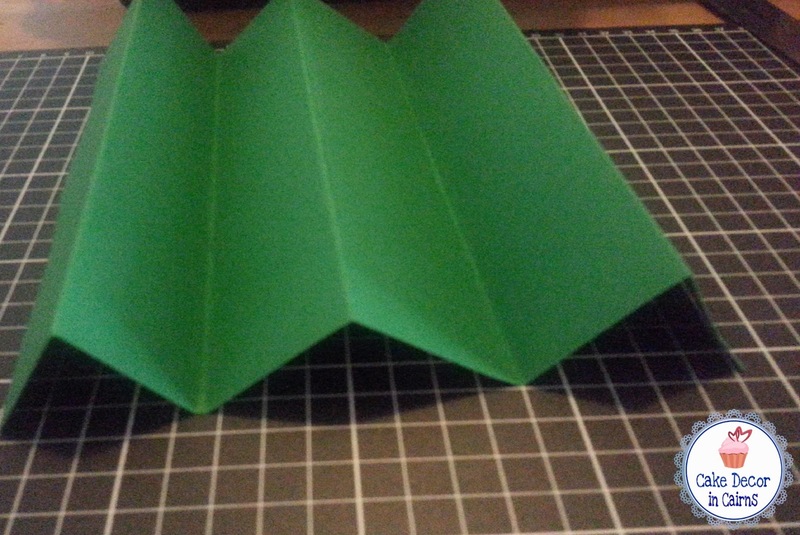 Make it into a Fan fold as pictured. 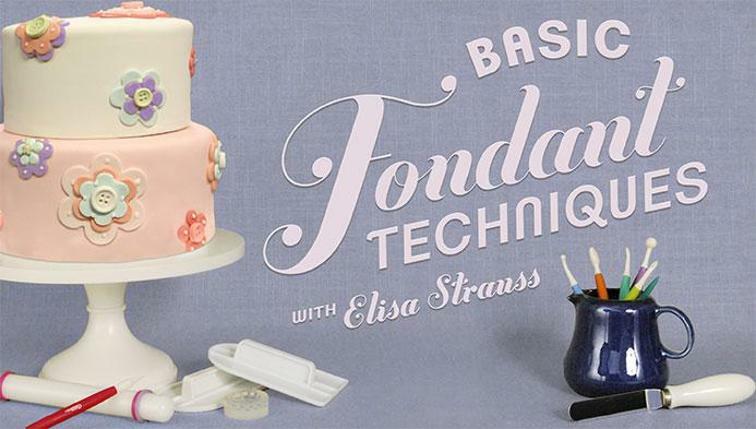 Put it aside and pull out your fondant. 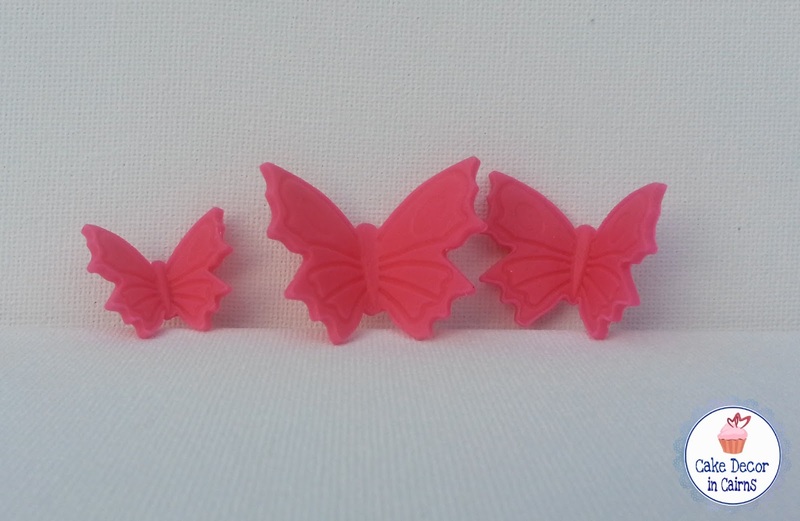 I only wanted to make about 5 butterflies in each colour so I am only using about a ping pong ball sized amount in these photos. 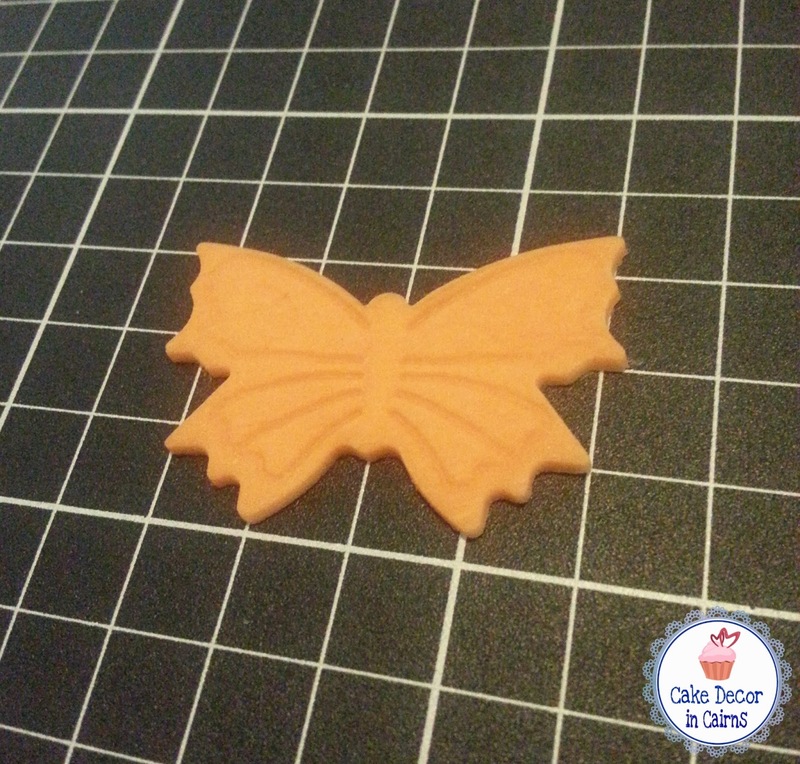 Roll out a strip of fondant (remember to have added CMC to it previously) I find using rolling pins with guides (the coloured bands) the easiest way to ensure all my butterflies are the same thickness. 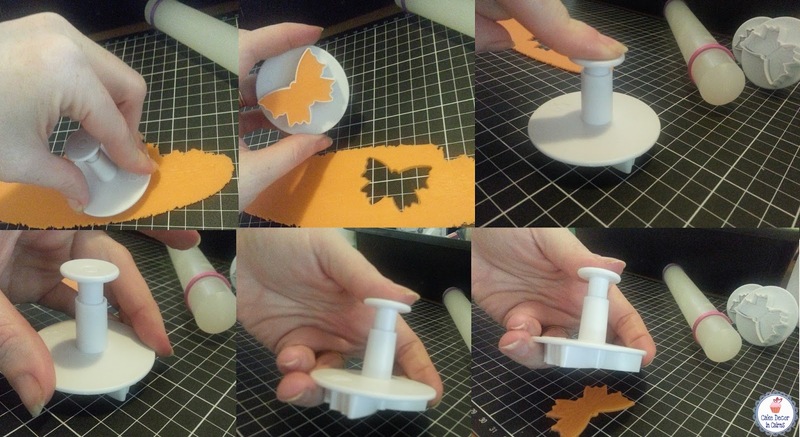 If you have never used a plunger cutter with fondant before there's a few little tips I have found work for me. 1. Cut the shape out first without pushing the plunger down. 2. Lift it up and move to another spot. 3. Push down on the plunger firmly pressing it as evenly as possible. 4. Kind of scrub the cutter on the mat a little, this ensure the edges are cut and the fondant will be picked up by the plunger. 5. & 6. Simply push down with your thumb to eject your butterfly out - usually in the place you want it positioned to dry this helps prevent breakage from moving it around too much. And here is the butterfly ready to dry. But wait it looks kind of flat and boring right? 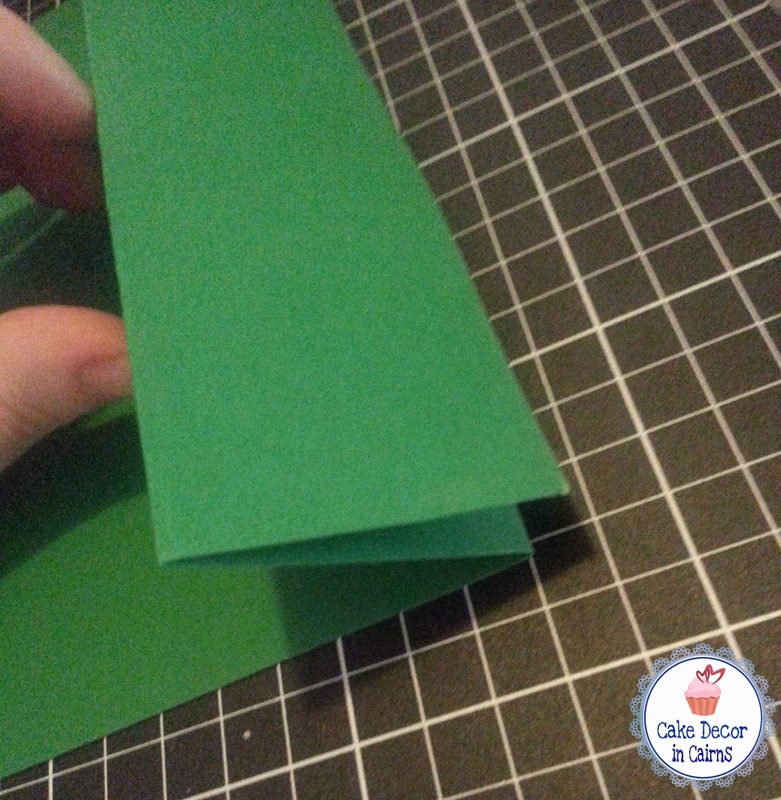 So pull out that cardboard from before and let's give some life to this little sugar shape . 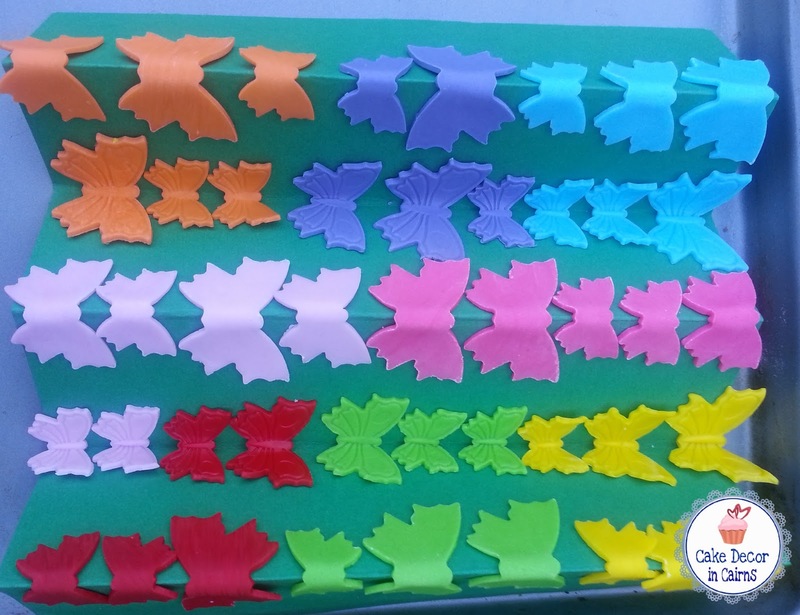 Place your butterflies as pictured to dry them into shape. 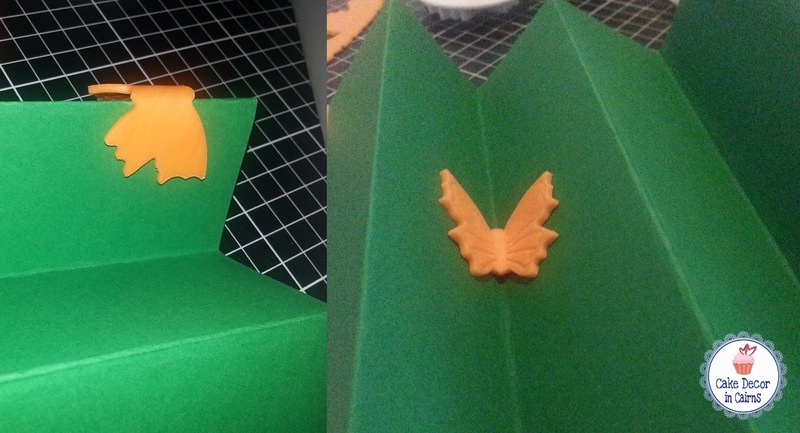 On the left you turn the butterfly upside down so that the win imprints are facing down. On the right you have the wings facing up. Leave them to dry in your home made cardboard former a few hours, on a humid day I would totally leave overnight to dry underneath a fan if possible. Once Dry, they look so much better with their wings open in flight!! Imagine those lovelies on your next cupcake! Gorgeous!!!! And the super awesome thing about all this is now you can store them in an airtight container for about 6 months to use for what ever occasion arises. Oh and I should mention, because I live in a high humidity area, I also pop in some raw white rice, or moisture absorber sachets to keep them in tip top shape for as long as possible. 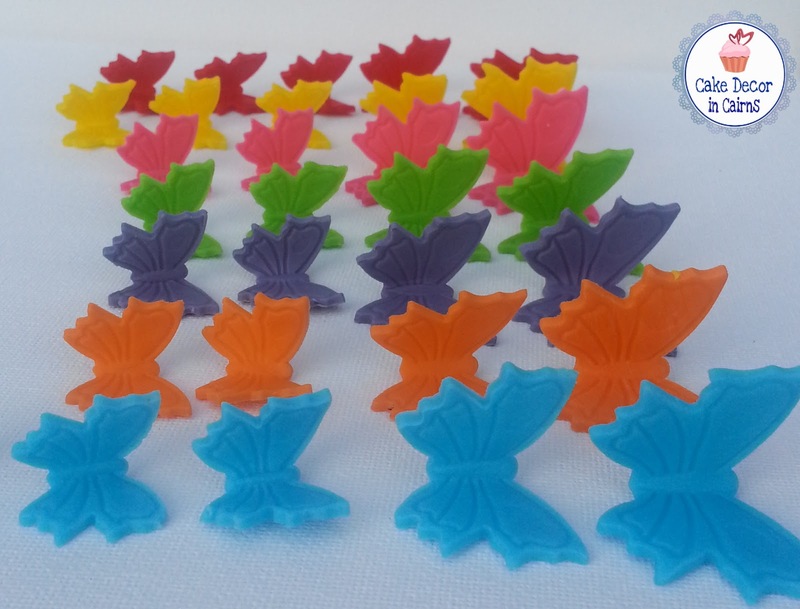 A Beautiful Rainbow of Fondant Butterflies!! That concludes Part 1 of My Back to Basics Series! Please let me know what you think in the comments section below! Click to go straight to Part 2!